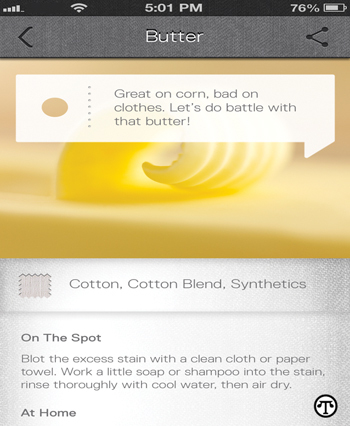 A new app for smartphones and computers is designed to help lighten the load on laundry day. (NAPSI)—Whether you are getting the kids’ clothes ready for school or putting your outfit together for a fashionable event, there’s good news-a new smartphone app can make your laundry life easier. • Getting custom laundry appliance guides tailored to your Whirlpool washer and dryer. “Now, with the help of our new and innovative WashSquad app, stain solving is simple and expert advice is available at your fingertips to help with any laundry woes,” said Mary Zeitler, fabric care expert and Lead Consumer Scientist with the Institute of Home Science. • For washable embellished items, consult your fabric care label first, then wash on the Delicate or Handwash cycle with cold water temperature selected and low spin speed. Remove the item from the washer and lay flat to dry on a clean towel, taking care not to stretch the fabric. Adjust the embellishments as needed to reorient them to their original position or shape. • With wine stains, it’s important to react quickly. Once the stain dries, it will be more difficult to remove. First, check the care label to be sure the item is machine washable. Rinse the stain well in running water to dilute it. If you cannot wash the garment while it is still wet, soak it in cool water with a bit of detergent until it can go into the washer. Wash the garment on the warmest temperature safe for the fabric. Remove the garment from the washer and allow it to air-dry if the stain appears to be removed. If the stain remains, repeat the process using a color-safe bleach. Not only creating innovative technology to streamline the fashion fabric care process, Whirlpool recently co-sponsored Strut, The Fashionable Mom Show during New York’s Mercedes-Benz Fashion Week. To download the free WashSquad laundry app, go to iTunes or www.whirlpool.com/washsquad. To learn more about the app and the brand, visit www.whirlpool.com.